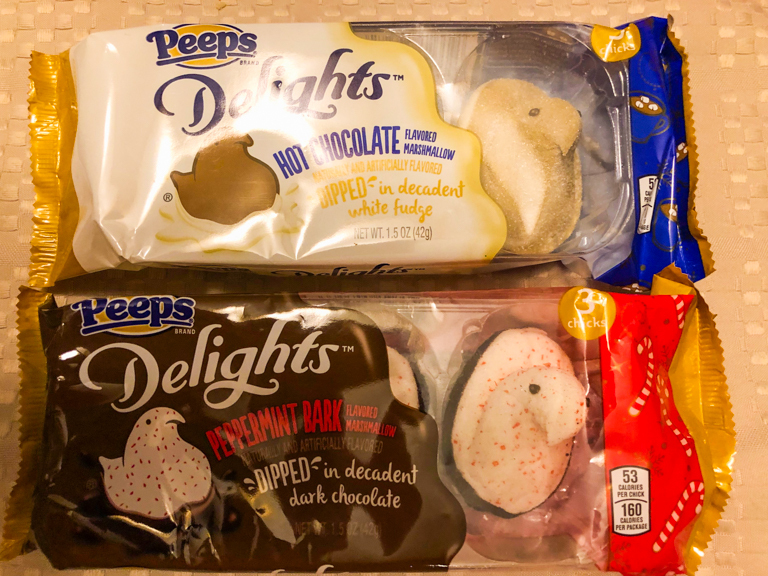 Next up in the product review, Peeps Delights! 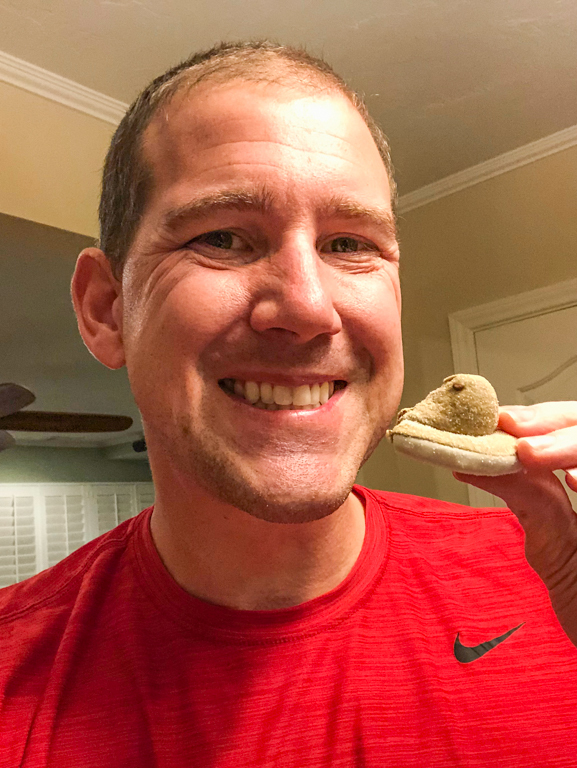 Peeps aren't just for Easter anymore and that makes me happy. I love Peeps! Today we've got two different flavors. And because they're "Delights" they're dipped in something extra. There's Hot Chocolate Peeps dipped in White Fudge, and Peppermint Bark Peeps dipped in Dark Chocolate. Here's the packages. Only 3 Peeps here compared to the standard Peeps 5 count. 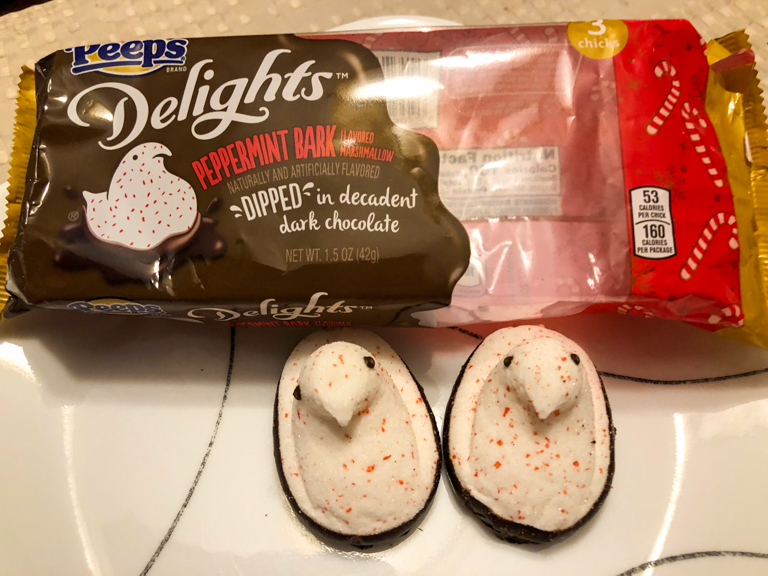 First up, Peppermint Bark Peeps. I love peppermint. I love marshmallow. I love dark chocolate. These connected on all three fronts. I thought they were great! I could totally eat lots of these. Alli nibbled the base of chocolate off the bottom. 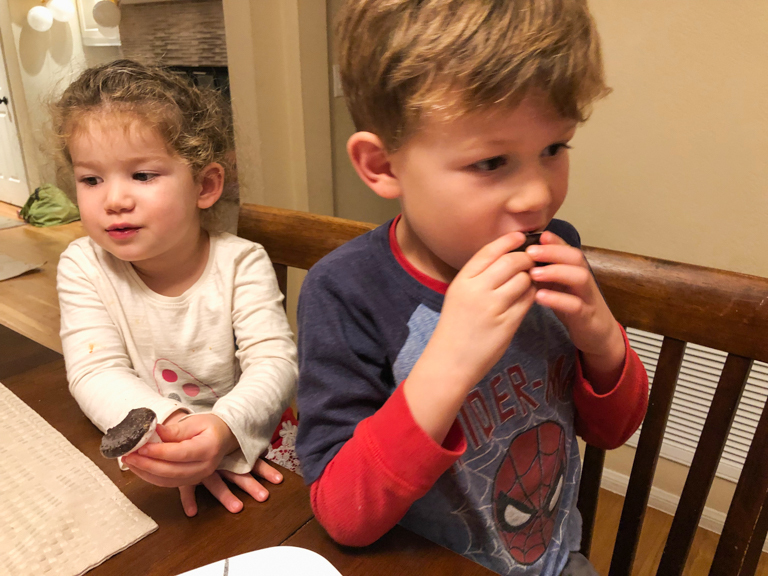 Then she ate the peppermint marshmallow off the top. Then she exclaimed "there's sugar on here!" Yes. Yes there is. 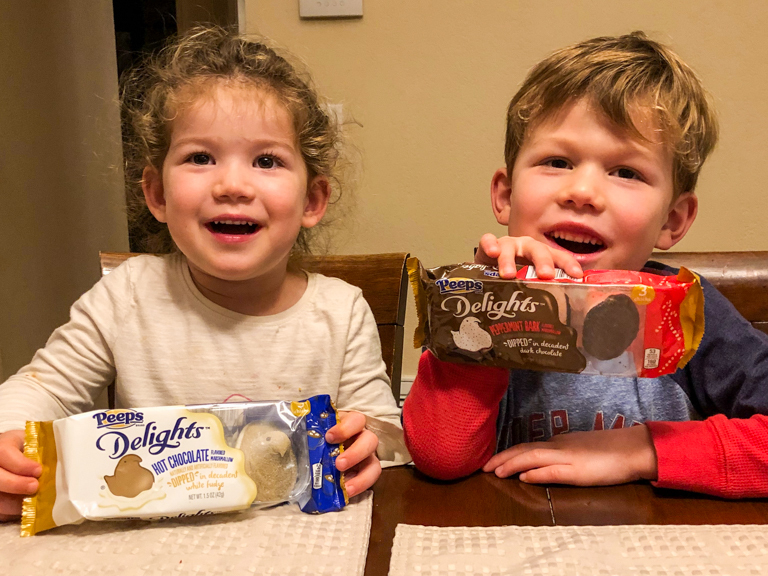 Welcome to the deliciousness of Peeps! 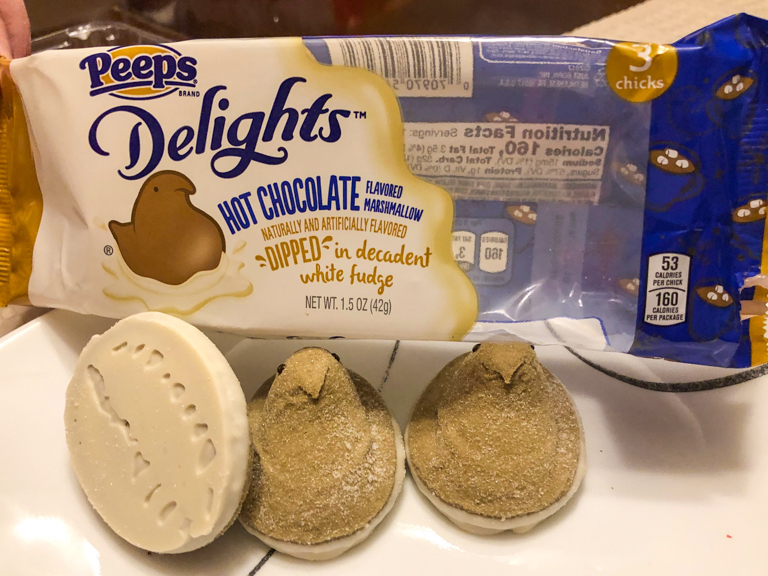 Time for the Hot Chocolate flavored Peeps covered with white fudge. The problem with trying to flavor something like chocolate without actually being chocolate is that it tastes artificial. That was the problem here. It tastes too much like a hot chocolate packet and not a delicious mug of rich hot chocolate. Not really a surprise though. But Peeps are Peeps. Marshmallow and sugar. Can't complain to much about that. I haven't heard of Scooter Pies, but according to my quick Google search, they're similar to Moon Pies. You can't go wrong with those. I love pink snowballs too. Adding coconut and cake to the marshmallow mix is always a good thing. It really comes down to what you're in the mood for at the time. Personally I'd rank them, Snowballs, Peeps, Moon Pies (only because the chocolate is kinda meh on those pies).